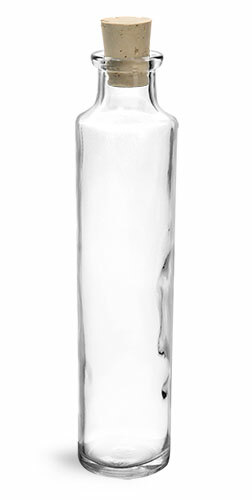 Available in a 4 oz size, this clear, tall glass cylinder bottle is offered with a cork top. This versatile bottle has many uses such as for packing bath salts or essential oils to name a few. Decorate it with a label or ribbon to create a great looking package. *Note* Without cork, glass bottle is 37 mm x 168 mm hgt.